Summary: We present three cases of unusual dural arteriovenous fistulae developing at other dural sinuses after resolution of initial lesions by treatment. In all three cases, the second lesions developed at different sinuses ipsilateral to the initial lesions, and the intervals between the resolution of the initial lesions and the appearance of the second lesions was <12 months. Clinical characteristics, including those previously reported, are discussed. Multiple dural arteriovenous fistulae (AVF) have been categorized into those involving multiple dural sinuses simultaneously (1–8) and those involving different dural sinuses after an interval of several months since complete angiographically proven resolution of initial lesions (6, 7, 9, 10). These two types of dural AVF have possibly different clinical features and should be distinguished from each other. We treated three cases of the latter, rarer type of dural AVF, surgically or with endovascular procedures, and we herein present our review of the literature and analysis of the cases. A 63-year-old man presented with diplopia and left blepharoptosis. A neurologic examination performed at admission revealed left oculomotor nerve palsy. Left external carotid angiography showed dural AVF involving the left cavernous sinus draining into both the left superior ophthalmic vein and the left inferior petrosal sinus (Fig 1A). Transverse-sigmoid sinuses were fully patent on both sides, without stenoses. Transvenous embolization was performed, and the affected left cavernous sinus was occluded with interlocking detachable coils (IDC; Boston Scientific, Japan) and free fibered coils (Tornade coils; Medicos Hirata, Japan). After embolization, the dural AVF were angiographically shown to be resolved and the patient’s clinical symptoms remitted within a week. Follow-up angiography was performed 3 months later and revealed complete resolution of the dural AVF. 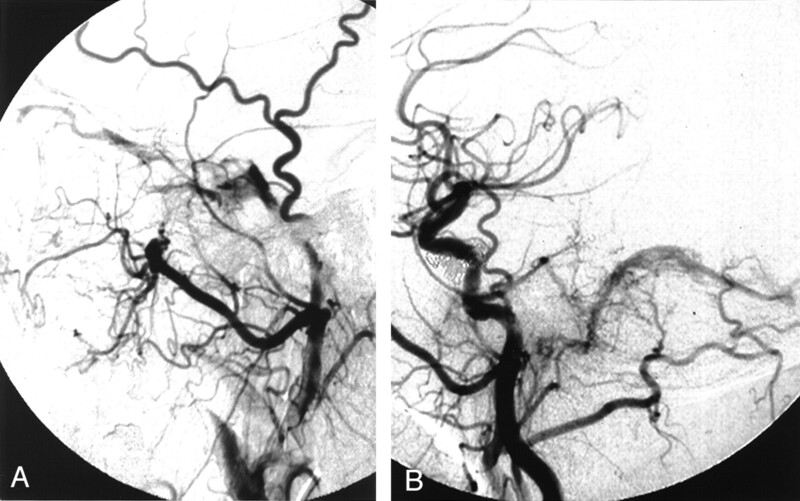 Angiograms of a 63-year-old man who presented with diplopia and left blepharoptosis (case 1). A, Lateral angiogram obtained at admission after left external carotid injection shows cavernous sinus dural AVF. 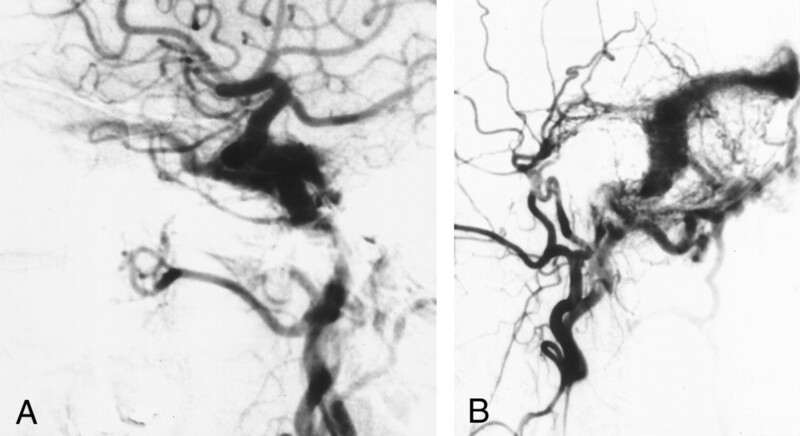 B, Angiogram obtained 10 months after resolution of initial cavernous lesion, achieved via transvenous embolization and after left common carotid injection, shows newly appearing left transverse-sigmoid sinus dural AVF. Ten months after embolization, the patient complained of pulse-synchronous tinnitus. A left retroauricular bruit was heard. Left common carotid angiography revealed a new dural AVF involving the left transverse sinus, with occlusion of the left sigmoid sinus (Fig 1B). Transvenous embolization of the affected left transverse sinus via the contralateral jugular vein was performed with interlocking detachable and free fibered coils. Follow-up angiography performed 9 months later revealed no evidence of the dural AVF. A 58-year-old man underwent follow-up angiography for an asymptomatic fusiform aneurysm of the right vertebral artery. Left common carotid angiography incidentally revealed a dural AVF involving the left superior petrosal sinus, draining only into the left petrosal vein in a retrograde fashion (Fig 2A). Both transverse-sigmoid sinuses were patent, and no stenoses were found at that time. The petrosal vein as a leptomeningeal venous draining route was microsurgically interrupted with a clip at the entrance into the superior petrosal sinus after transarterial embolization of several feeding branches of the external carotid artery. Angiograms of a 58-year-old man with an incidentally revealed dural AVF involving the left superior petrosal sinus (case 2). A, Lateral angiogram obtained after left internal carotid injection shows dural AVF involving the left superior petrosal sinus with leptomeningeal venous drainage. B, Angiogram obtained 6 months after treatment with microsurgical interruption of venous draining route and after left common carotid injection shows dural AVF involving the left transverse-sigmoid sinus. Six months after the operation, the patient complained of pulse-synchronous tinnitus. Angiography revealed the new appearance of a dural AVF involving the left transverse-sigmoid sinus (Fig 2B). Occlusion of the sigmoid sinus near the jugular bulb, resulting in retrograde venous drainage into the contralateral transverse sinus, was observed. The patient underwent transvenous embolization of the involved sinus with interlocking detachable and free fibered coils. No recurrence of the dural AVF was found on follow-up angiograms obtained 10 months later. A 58-year-old woman presented with left proptosis, hyperemic conjunctiva, and chemosis. A neurologic examination revealed left oculomotor palsy with a periorbital bruit. Left external carotid angiography revealed a dural AVF involving the left cavernous sinus and draining into the left superior ophthalmic vein and inferior petrosal sinus (Fig 3A), without sinus occlusions. The patient was treated with manual Matas maneuver of the left carotid artery. Her symptoms gradually regressed, and resolution of the lesion was noted on angiograms obtained 4 months later. Angiograms of a 58-year-old woman who presented with left proptosis, hyperemic conjunctiva, and chemosis (case 3). A, Lateral angiogram obtained after left common carotid injection shows cavernous dural AVF. B, Angiogram obtained 4 months after resolution of lesion, achieved via manual Matas maneuver, and after left external carotid injection shows left transverse-sigmoid sinus dural AVF. However, another 4 months later, the patient complained of pulsatile tinnitus. Angiography revealed the new appearance of a high flow dural AVF involving the left transverse-sigmoid sinus, with occlusion of the left proximal sigmoid sinus (Fig 3B). The patient was suffering from severe insomnia because of the tinnitus. Surgical sinus isolation was performed after transarterial embolization, and the affected sinus was finally removed. The patient’s symptoms were resolved, and angiographically proven resolution of the dural AVF was achieved. Multiple dural AVF are unusual, and both their pathogenesis and process of development are still unknown. The term multiple dural AVF has two different meanings in the literature: some authors use the term to indicate dural AVF that developed at different sinuses simultaneously, whereas others use it to indicate second dural AVF that developed at other sinuses at an interval after the resolution of initial dural AVF. The latter type of dural AVF are rarer; to our knowledge, only four cases can be found in the literature. Kubota et al (7) reported the case of a 43-year-old woman with left cavernous sinus dural AVF who was treated with transvenous embolization via the left superior ophthalmic vein. This dural AVF was shown by angiography to be resolved, and the patient’s clinical symptoms remitted. Four months after embolization, follow-up angiography revealed the new appearance of a dural AVF involving the left jugular bulb. Yamashita et al (10) reported the case of a 54-year-old woman with a left cavernous sinus dural AVF that was successfully treated with transvenous embolization via the inferior petrosal sinus. Twelve months later, she presented with tinnitus, and a new dural AVF involving the left sigmoid sinus was found. Nakagawa et al (9) described a 43-year-old woman whose initial angiography revealed a left cavernous dural AVF. Transvenous embolization was performed, and her clinical signs improved. However, 5 months after the initial treatment, a new dural AVF involving the left sigmoid sinus was found. Kuwayama et al (6) reported two cases of multiple dural AVF; one is herein presented as case 3, and the other case had multilocated lesions. Several interesting features emerged from our analysis of the previously reported cases and those presented herein (Table). First, in all cases, the second dural AVF developed in different sinuses, but on the side ipsilateral to the initial lesion. Second, the interval between the development of the second dural AVF and the resolution of the initial lesion was <1 year and ranged from 3 to 12 months (mean, 5.4 months). Third, the treatment of the initial dural AVF was transvenous embolization for all except two patients, one of whom was treated with the manual Matas maneuver and the other of whom was treated with microsurgical interruption of the leptomeningeal venous draining route. Moreover, in our three cases and one case in the literature (9), transverse-sigmoid sinuses were patent when the initial fistulae were found and they occluded at the time of the appearance of the second fistulae. 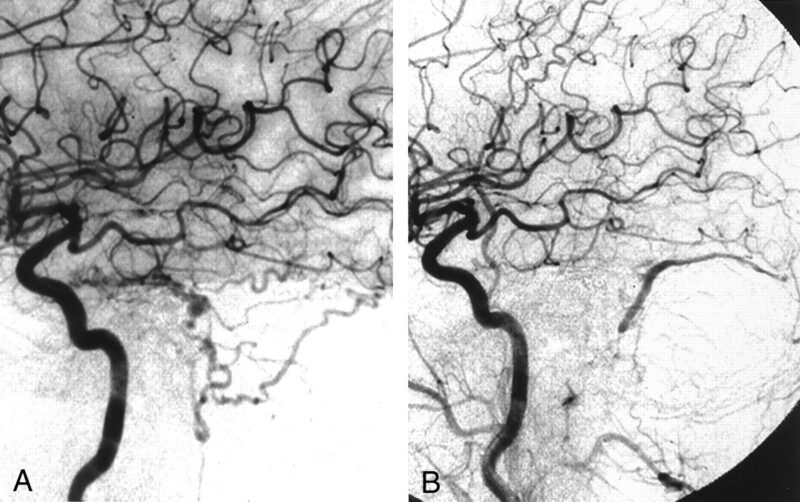 The intervals between angiography sessions ranged from 3 to 6 months (mean, 5.0 months), indicating that sinus occlusion progressed and became complete within several months. It was not noted and remained unknown whether there was major sinus occlusion at the time of initial fistulae in the other two cases in the literature; they did, however, have occlusion at the transverse-sigmoid sinus when the second fistulae appeared. Further analyses of such cases of dural AVF are needed to explain the three common findings noted above: ipsilateral occurrence, interval of <1 year between the second dural AVF and resolution of the initial lesions, and previous transvenous embolization. These lesions may be de novo, but based in our analysis, therapeutic sinus occlusion by coils and subsequent sinus thrombosis may activate angiogenetic factors on the adjacent dural sinus, for which incubation may be within 12 months (11, 12). We propose that the term multiple dural AVF not be used to describe dural AVF that develop consecutively in different sinuses so that we can differentiate between those and simultaneously multilocated lesions. Careful angiographic follow-up is needed for ≥1 year for patients with dural AVF who have been treated with transvenous embolization. Accepted after revision November 29, 2001.